His screenprinted works have been exhibited in the United States, Canada, Spain and The Netherlands. 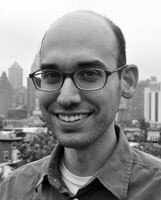 To learn more about Greg, you can visit his website: www.gregpizzoli.com. You can also follow his work at his Blog and Tumblr. Greg is also on Facebook and Twitter. People ask me this question all the time, and I feel weird answering it because I am so early on in my career – my first book comes out in May – so I am very much still figuring things out; how I like to work, what kind of projects I really want to invest in and so forth. Also, I think my experience was somewhat unique, so I feel bad because I have to preface with “Ok, I’ll tell you how it happened for me, which will probably in no way help you, but…” – so anyway, here goes: I studied English Lit in college, with a minor in studio art, and immediately after college, I joined the AmeriCORPS VISTA (Volunteers in Service to America) program for two years. While in AmeriCORPS, I started to work with kids and I began to silkscreen and draw a lot more in my spare time. After two years of volunteering full-time I went back to school to study art at the graduate level, this time in Printmaking and Book Arts in Philadelphia. Before grad school I was mainly focused on making rock posters, mini comix, and zines, but while in school I become more and more interested in writing, and picture books in particular. As part of my graduate thesis I wrote, illustrated and hand-printed two editions of totally weird (and in retrospect, somewhat dull) children’s books. After getting my MFA, I immediately started teaching silkscreen at The University of the Arts, in both the undergraduate and continuing education programs. By some miracle, author/illustrator Brian Biggs was enrolled in my first CE class, and we fast became friends over our mutual interests in silkscreen, children’s books, and Indian Pale Ales. Unbeknownst to me, Brian sent my website link to his literary agent at Writers House, Steven Malk. Steven and Brian ended up coaching me through my first meetings with publishers, guiding me as I expanded my portfolio, designed promotional postcards, and created a new website. I was working a full-time dead-end kind of job, gambling that the work I was doing in my studio would eventually pay off. It was a long two years, and Steven, Brian, along with Bob Shea, became great mentors to me. In the summer of 2010, after about a year of emailing, Steven took me on as a client and we continued to work together to get my work to the point where it needed to be. His advice was to slow down, be patient, and to only put my best work out there. I spent a lot of time at the library, learning about picture books: what works, what doesn’t, and figuring out my voice as an author/illustrator. I did my best to follow their advice while teaching part-time at night and working a full-time job in an office. I did most of my drawing and writing early in the morning or after work. In January of 2011, I attended my first SCBWI conference in NY, and was lucky enough to win a Portfolio Honor Award which got my work in front of a lot of publishing people. A few days later an editor from Disney*Hyperion emailed asking if I had a story to go along with my piece from the conference, and I didn’t, but I got to work on it. At that same time, I was showing other ideas to my buddies Bob Shea and Mac Barnett who helped me develop the next story, which became “The Watermelon Seed”, which is coming out in May of 2013. Another picture book I wrote (and will draw soon) will also be published by Disney*Hyperion in the Summer of 2014, and both are with my wonderful editor, Rotem Moscovich, who found my work at SCBWI. This past summer, Steven and I started getting requests from publishers for me to illustrate stories written by other authors, which I am working on now. I’m doing a Halloween counting book with FSG, and a book about a brave spider with Candlewick. Obviously we’re all influenced by too much to even remember, but here are some things that I’ve been looking at a lot recently, and some which I’ve carried always: The Muppets, Sesame Street, Peanuts, etc. Cuban poster art, with the greatest influencer from that genre being Eduardo Munoz Bachs. I’m also always impressed by images from Seripop, Landland, Zeloot and Michael Deforge. Philadelphia has an amazing concentration of talented illustrators: Tim Gough, Zach OHora, Brian Biggs, Matt Phelan, and Bob Shea who isn’t from Philly, but visits often. I have a pretty obscene collection of picture books and I probably most often grab those drawn by Maurice Sendak, Jim Flora, Will & Nicolas, Tove Jannson, Carson Ellis, Richard Scarry, Tomi Ungerer, James Marshall, Ed Emberley. I also really love Blex Bolex’s work. Many more. Color seems to be the thing that people most frequently comment on in my work. My work process is grounded in the traditions of printmaking, where every additional color means hours and hours of work, so my palette is usually limited to five colors or less, which means I’m pretty deliberate with my color choices. The watermelon seed was printed in three spot colors, instead of CMYK, and I think it will really stand out because of the limited palette and the inks and paper we chose. Challenge: Probably volume? I don’t know. I took a life drawing course this spring to exercise those muscles a bit, and I was satisfied that I can still draw from life when I want. It seems I rarely want to. The illustrators and designers I’ve always been attracted to have created very flat worlds, I guess when your biggest influences are Ed Emberly, Richard Scarry, Sendak, Quentin Blake, etc, its unavoidable. But I also think its just what I’m doing now, and who knows where I’ll be in the future. I’m 29, things could change. I’m a big user of to-do lists. I also have a program on my computer that blocks facebook/twitter/tumblr/etc for however long you choose, which is good. A typical day looks something like this: wake up, coffee, ten minute walk from apartment to studio, on a good day getting there right around 9am, an hour of emails and general putzing, make a to do list and then doing my best to blow through the list. Some days I teach in the mornings or evenings, so I may spend time prepping for a class. I like to have several projects going on at once, and I can dip in and out of them depending on my deadlines, and mood. I typically work on whatever until about 8 and then go home. Work hard and be nice to people is a cliche, but for good reason. Also, just make a ton of work. If you keep making stuff, and don’t obsess over failures, you’ll end up getting better. It’s inevitable if you make enough. Regular postcards definitely helped me – it’s can be expensive but it gives you something new to be able to give people and direct them to your website, which should be clean, and NOT play any music. Well, probably the thing I’m most excited about right now is that my first picture book, “The Watermelon Seed”, is being published this upcoming May. I did the writing and the drawings and I’m really pleased with how it came out, and incredibly excited to have other people enjoy it. It comes out May 7th, and the huge-online-retailer-that-should-not-be-named has it available for pre-order now. I have another picture book coming out with Disney*Hyperion in 2014, it’s another one with my fantastic editor Rotem Moscovich. I have also been fortunate enough to be asked to illustrate books that other people have written and am working on one for Candlewick, and one for Farrar, Strauss, and Giroux. They are both fun books and I’m excited about them. The FSG one will be out Summer 2014, and the Candlewick book will come out Spring 2015. 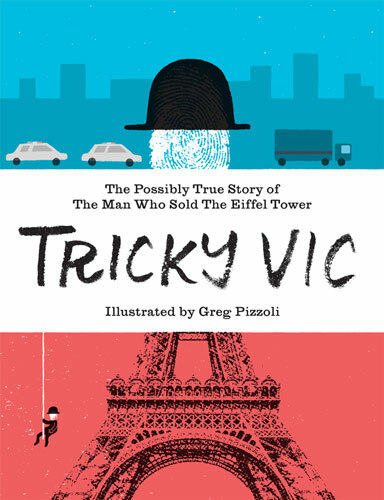 I also just finished a new zine about a con-man who sold the Eiffel Tower for scrap metal, which is based on a true story. It’s called “Tricky Vic” and is a bit of a diversion for me. The art is much more graphic, more like editorial illustration. I’ve wanted to make this zine for 3 years or so and just haven’t ever found the time, but I was able to audit an offset printing class at The University of the Arts in Philadelphia and make “Tricky Vic” in the class. I designed the whole thing mainly at night over a few weeks. It feels really loose and graphic, and I’m digging it. It will be available on my etsy shop in December for only ten bucks. Other than that I’m storyboarding the book trailer for “The Watermelon Seed”, and sketching out new book ideas. And I still make screenprints, etc to keep me on my toes. And with that, we conclude Greg’s visit and interview. Thank you, Greg! I will see you next week here when I’ll be interviewing and sharing the amazing work of Constanze Von Kitzing. Thanks for the interview with Greg, Juana. I liked that his path to publication story included (industry) people helping people. When I tell these stories to folks who work in other fields, they’re surprised by all the giving. I guess it comes naturally to writers and illustrators and all those professionals who make up the children’s book marketplace. Thank you for reading, Rhonda! And you are absolutely right, the people in this kidlit industry are really great!